It comes as no surprise to learn that at Embassy Electrical Supplies in Clerkenwell, you can buy lightbulbs, fuses and cables, but rather more unexpected to discover that, while you are picking up your electrical hardware, you can also purchase olive oil, strings of chili peppers and pomegranate molasses courtesy of the Murat family groves in Cyprus and Turkey. At certain fashionable restaurants nearby, “Electrical Shop Olives” are a popular feature on the menu, sending customers scurrying along to the Murats’ premises next morning to purchase their own personal supply of these fabled delicacies that have won acclaim in the global media and acquired a legendary allure among culinary enthusiasts. How did such a thing come about, that a Clerkenwell electrical shop should be celebrated for olive oil? Mehmet Murat is the qualified electrician and gastronomic mastermind behind this singular endeavour. I found him sitting behind his desk at the rear of the shop, serving customers from his desk and fulfilling their demands whether electrical or culinary, or both, with equal largesse. 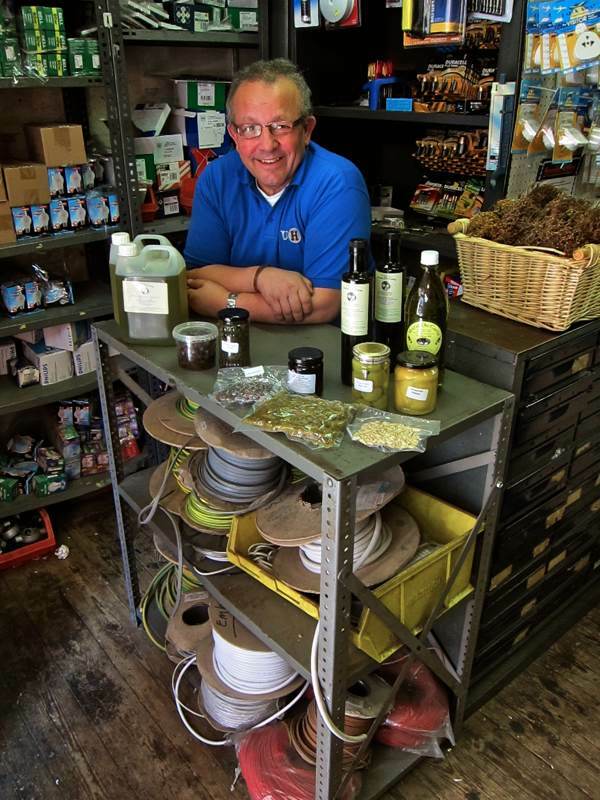 “I am an electrician by trade,” he assured me, just in case the fragrance of wild sage or seductive mixed aromas of his Mediterranean produce stacked upon the shelves might encourage me to think otherwise. “I arrived in this country from Cyprus in 1955. My father came a few years earlier, and he got a job and a flat before he sent for us. In Cyprus, he was a barber and, according to our custom, that meant he was also a dentist. But he got a job as an agent travelling around Cyprus buying donkeys for Dr Kucuk, the leader of the Turkish Cypriots at that time – the donkeys were exported and sold to the British Army in Egypt. What he did with the money he earned was to buy plots of land around the village of Louroujina, where I was born, and plant olive saplings. He and my mother took care of them for the first year and after that they took care of themselves. Once they came to the UK, they asked relatives to watch over the groves. They used to send us a couple of containers of olive oil for our own use each year and sold the rest to the co-operative who sold it to Italians who repackaged it and sold it as Italian oil. I trained as an electrician when I left school and I started off working for C.J. Bartley & Co in Old St. I left there and became self-employed, wiring Wimpy Bars, Golden Egg Restaurants and Mecca Bingo Halls. I was on call twenty-four hours and did electrical work for Faye Dunaway, the King of Jordan’s sister and Bill Oddie, among others. 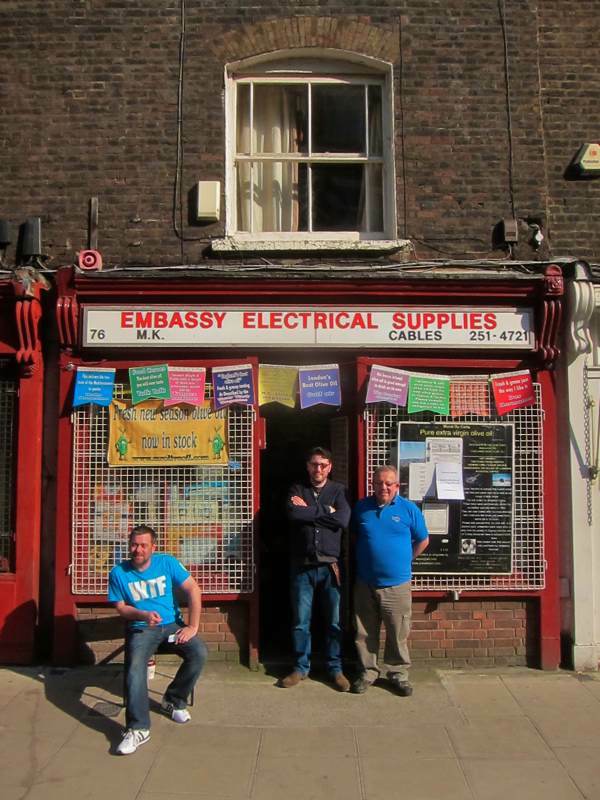 Then I bought this shop in 1979 and opened up in 1982 selling electrical supplies. In 2002, when my father died, I decided I was going to bring all the olive oil over from Louroujina and bottle it all myself, which I still do. But when we started getting write-ups and it was chosen as the best olive oil by New York Magazine, I realised we had good olive oil. We produce it as we would for our own table. There is no other secret, except I bottle it myself – bottling plants will reheat and dilute it. If you were to come to the village where I was born, you could ask any shopkeeper to put aside oil for your family use from his crop. I don’t see any difference, selling it here in my electrical shop in Clerkenwell. It makes sense because if I were to open up a shop selling just oil, I’d be losing money. The electrical business is still my bread and butter income, but many of the workshops that were my customers have moved out and the Congestion Charge took away more than half my business. Then Mehmet poured a little of his precious pale golden olive oil from a green glass bottle into a beaker and handed it to me, with instructions. The name of his farm, Murat Du Carta, was on the label beneath a picture of his mother and father. He explained I was to sip the oil, and then hold it in my mouth as it warmed to experience the full flavour, before swallowing it. The deliciously pure oil was light and flowery, yet left no aftertaste on the palate. I picked up a handful of the wild sage to inhale the evocative scent of a Mediterranean meadow, and Mehmet made me up a bag containing two bottles of olive oil, truffle-infused oil, marinated olives, cured olives, chili flakes and frankincense to carry home to Spitalfields. We left the darkness of the tiny shop, with its electrical supplies neatly arranged upon the left and its food supplies tidily stacked upon the right. A passing cyclist came in to borrow a wrench and the atmosphere was that of a friendly village store. Outside on the pavement, in the sunshine, we joined Mark Page who forages truffles for Mehmet, and Mehmet’s son Murat (known as Mo). “I do the markets and I run the shop, and I like to eat,” he confessed to me with a wink. 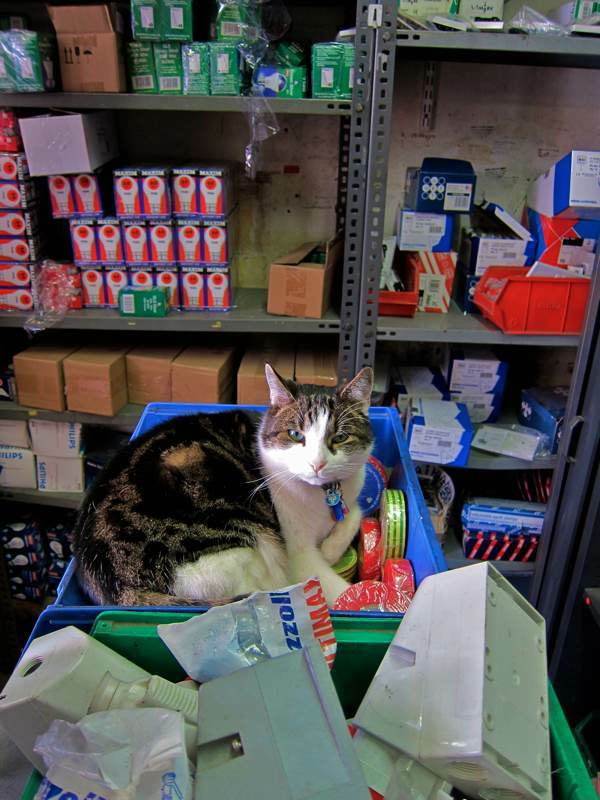 Carter, the electrical shop cat. From left to right, Mark Page (who forages truffles), Murat Murat (known as Mo) and Mehmet Murat. How lovely and tasty the olive oil sounds and to be sold amount light bulbs how funny but excellent. i love this. what a beautiful world. how could you tell from the facade of this shop there was…..frankincense within? and, i want to live in that apartment above the shop. To think I have been buying diluted olive oil. How generous and inventive people can be. A trip to Mehmet’s shop for olive oil tasting is a must. Ooh, I wish I could pop into his shop! On the face of it seems madness to sell olive oil in an electrician’s shop. But boy oh boy, this is none of your second or third pressed olive oil, this is the real thing, the cordon bleu of olive oils. This is it. Fascinating story, gentle author. Mr Murat sounds like a really contented chap who deserves every blessing which comes his and his family’s way. Diversification so needed for the shopkeepers of this world. Well done! Thank You! A very timely repost for me as I had been searching the archives to find this piece- I’m making a foray up the UK and wanted to visit Embassy, and here’s all the details I need- wonderful!